Parents of my students often ask me how they can start speaking Spanish with their children at home. Specifically, they ask me for common Spanish phrase for kids. Most of these parents have studied Spanish at some point and are comfortable reading and pronouncing the language, but do not have enough fluency or vocabulary to use it naturally. I encourage families to do the take-home activities I provide, to read picture books, listen to music and sing with their children. I also provide them with a list of common Spanish phrases that they can use in everyday situations with their kids. Many of the Spanish sentences I suggest are contextual, that is, you use them in specific situations and the meaning is clear from what you are doing. Most of the questions can be answered yes or no and are not necessarily part of a more complicated conversation. More than anything, these common Spanish phrases and questions are used over and over again, so children have the chance to hear them repeatedly and internalize the meaning and structure. 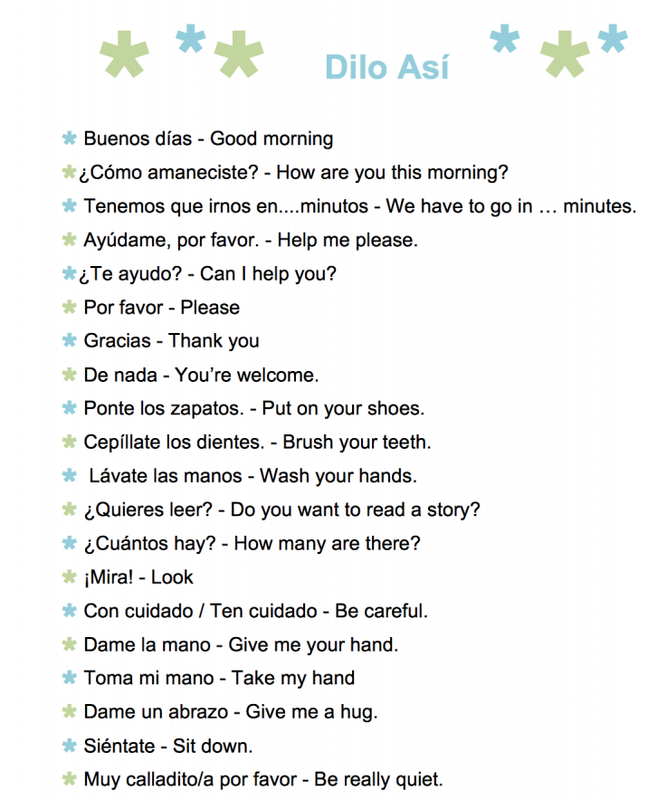 Below is a list of common Spanish phrases that parents and childcare providers can incorporate into daily routines. You can personalize the list, adding things you say to your child on a regular basis. Ask a native speaker or do a little research to learn how to say phrases that fit your routine. For example, if your child feeds the cat, you can add Dale de comer al gato, por favor (Please feed the cat). Start with just three or four phrases. When you are comfortable using those, and remember to use them consistently, add a few more of these common Spanish phrases to your daily routine. The verb forms in these suggestions are for speaking to one child. There is a printable version of this list, called Dilo así (Say it like this), at the end of the post. You can print it to use as a reference as you learn the phrases. There is also an MP3 audio file. – Cepíllate los dientes. – Brush your teeth. – Lávate las manos – Wash your hands. – Tiende la cama. – Make your bed. – Ponte los zapatos. – Put on your shoes. – Amárrate los zapatos – Tie your shoes. – Tenemos que irnos en….minutos – We have to go in … minutes. – Dame un abrazo. – Give me a hug. – De nada – You’re welcome. – Ayúdame, por favor. – Help me please. – ¿Te ayudo? – Can I help you? – ¿Cuántos hay? – How many are there? – ¿Dónde estás? – Where are you? – Cierra la puerta. – Close the door. – Apágalo. – Turn it off. – Con cuidado / Ten cuidado – Be careful. – Dame la mano. – Give me your hand. – Toma mi mano. – Take my hand. – Camina, por favor. – Walk, please. – No corras. – Don’t run. – Ven acá. – Come here. – No toques. – Don’t touch. – Siéntate. – Sit down. – Muy calladito/a por favor – Be really quiet. – Me gusta – I like it. – ¿Te gusta? – Do you like it? – Dime otra vez. – Tell me again. – Hazlo de nuevo – Do it again. – Me encanta. – I love it. – Lo haces bien. – You do that well. – Lo hiciste bien. – You did it really well. – Bien hecho. – Well done. – Intenta otra vez. – Try again. – Ganaste. – You won. – Gané. – I won. – Me toca. – It’s my turn. – Te toca. – It’s your turn. – Pon la mesa – Set the table. – ¿Quieres agua? – Do you want some water? – ¿Tienes hambre? – Are you hungry? – A comer – Come eat. – Es hora de comer – It’s time to eat. – Cómetelo – Eat it up. – ¿Quieres más? – Do you want more? – ¿Acabaste? – Are you done? – Guarda los juguetes – Pick up your toys. – A la cama – Time for bed. – Apaga la luz. – Turn off the light. – Es hora de dormir. – It’s time to go to sleep. – Es hora de ir a la cama. – It’s time for bed. – ¿Quieres leer? – Do you want to read a story? – Que sueñes con los angelitos. – Sweet dreams. – Te adoro. – I love you (I adore you). – Te quiero. – I love you. Well done! These are definitely the phrases that I use over & over & over with my own kids!! I fall exactly into the category you mentioned: comfortable in Spanish, but not familiar with all the expressions one would use when playing games, etc, with kids. This will be soooo helpful! So glad you stopped by my blog so that I found yours. These phrases are very helpful for kids of all ages. Thank you. These are very helpful, thanks so much! Great phrases! I use them with my kids. How do you say, Clear the table? do the dishes? Take a bath or shower, brush your teeth/ hair. Is it- cepillate los dientes/ pelo? Toma un bano? I spent all day looking for this and I finally found it!! I’m so happy!!! I remembered seeing it a few weeks ago but had forgotten to print it. Thank you so much for this..I can’t wait to use this at home with my 5 year old daughter!! This list is going to be very helpful for my daughter as well. She and I are native spanish speakers and I would like to teach her a couple of expressions in English. Thanks so much! This list is very useful! I am trying to teach my children Spanish and although I can read and write Spanish, I am not very fluent, so I find it a challenge. And these are things I say to them everyday so it will be great to say it to them in Spanish and NOT English 🙂 Well done. This site is so wonderful! Thank you!! Do people also use “te amo” when speaking to family (e.g. Mother to daughter and vice Versa)? I’m glad Spanish Playground is helpful. Your question about te amo is great. Like everything in Spanish, it depends where you are. In Mexico, in general te quiero is used with family and friends and te amo is used in romantic relationships. In Peru however, it is 100% normal for a parent to say te amo to a child. I’ll ask on my Facebook page and see if we can get a list of more countries where parents say te amo to their kids. This is just what I’m looking for, a took Spanish st school and loved it and wanted to teach my kids . Thank you for this helpful resources, I will share your page on my Facebook page to help others to learn Spanish. I’m glad Spanish Playground is helpful. Good luck!